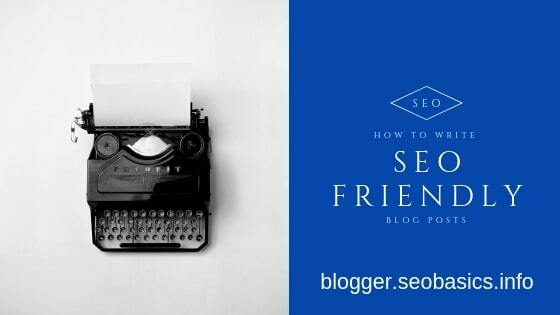 How To Write SEO Friendly Blog Posts: Here, you can read about the best tips on how to write blog posts that will convert into traffic on your blog posts. How To Write SEO Friendly Blog Posts: In this article, you can learn the best tips on how to write blog posts that will convert into traffic on your blog posts. These 12 tips are some of the best and basic SEO and Content Marketing tips for Blogger or Blogspot blogs. Don't forget to read also our article about how to optimize blogger blogs, SEO Blogspot: Best Proven Tips and Blogger SEO Plugin. 1. Write page titles that have your main keyword enclosed and that grab attention. List type and "how to" headlines have an inclination to perform better. Use Coschedule tool to ascertain take a look at your page titles before publishing your article. 2. Write meta description that stands out in the SERPs, write a good meta description, check the description of ads on SERP for the keyword that you simply are focusing and get inspired from their description. 3. Find good keywords with the keyword research method and notice keywords that have good search volume and low SEO difficulty. There are plenty of keyword research tools on the web that you simply can use. 4. Write the focus keyword in the beginning paragraph of your post, and also use semantically related keywords throughout the text of your copy, but make it look natural. 5. Optimize images by compressing them before uploading them to your website, after uploading, use ALT text to describe your images and use your focus keyword on them, write image title, and set the image dimensions on the HTML. 6. Use SEO friendly URLs, this means, you should use static URLs with the focus keyword on them, make them short so that readers can remember them. 7. Use internal links on the pages naturally, use internal links additionally on the sidebar for the pages that are most significant on your website. 8. Use heading tags to structure the content on your website, and use keywords on them. Use one H1 per page by using the focus keyword on it - H1 is the most important and use approximately fifteen H2 tags per page, use H2 to format the post and use related keywords on them. 9. Take away Ghost pages from your website. Ghost pages are pages that have thin content, pages that have duplicate content, and pages that do not have any traffic on your site and have the smallest amount important for your business. Read also on how to remove duplicate content from blogger blogs. 10. Use social bookmarking, blogger outreach and other link building methods to get authoritative related backlinks that point to pages of your website. 11. Get listed on local directories, getting listed on Google is a great start to improve your local SEO. 12. Improve your blog load speed, do a test on the PageSpeed Insights from Google, or use Think with Google Test Speed tool, and implement as many recommendations from there as you can. These are some basic however also vital SEO tips that plenty of internet sites doesn't implement them. You are welcomed to express your opinion on this article! To do it use the real-time comments form belove. Please read our Comment Policy before commenting.